We're big fans of Jamaican Sean Paul here at SCP. We've brought you the videos for She Doesn't Mind and Got 2 Luv U and even brought you a teaser of his new album Tomahawk Technique. Well the album will be in store in Australia on 9 April, and it's already out in most countries around the world. Sean Paul has sold over 10 millions albums world wide and he's used some big name producers who've worked with Katy Perry, Justin Bieber, Ne-Yo and Rihanna on his new effort. He's a talented musician too, writing or co-writing the majority of the songs on Tomahawk Technique. 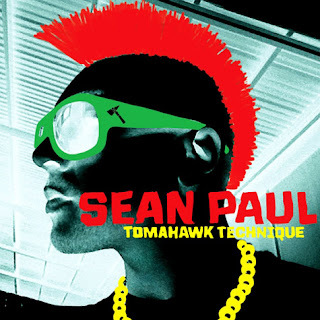 We've spent the past few days reviewing the latest from Sean Paul and if you're a fan, you're going to love Tomahawk Technique. You already know 2 of the singles and there's lots more to come. Firstly let's get re-acquainted with the first single Got 2 Luv U featuring the fabulous Alexis Jordan. Like any album, there are certain songs that immediately stand out. Our bet for the next single will be the unique Hold On. It's not a cover of the Wilson Phillips classic, but similarly it's a song that can provide inspiration. Lyrically many will gain strength from this track and that its beautifully produced means it will gain many fans. A lot slower than a normal Sean Paul song but this slowness suits the nature of the track. Next up is the much more upbeat Roll Wid Di Don. A brilliant track that invokes head bobbing from the first listen! Very funky, very fresh and classic Sean Paul. One song that really caught our attention is How Deep Is Your Love. It primarily caught our attention because we thought it may be a remake of the Bee Gee's classic but also because it features Kelly Rowland! Well it's not a Bee Gee's remake but it is a great track, Kelly's smooth vocals complementing Sean's rapping. Body is another great track - interesting use of a backing track that gives the song a vaguely haunting feeling. We think you'll love this album. It's classic Sean Paul - interesting, well produced and pretty damn funky. Get it on iTunes soon..!